In this two minute HR Blast we share some of the issues we are seeing businesses face around ‘change’ and some of our ideas about how to manage change successfully. Please feel free to share this with your line managers who are responsible for the change within your organisation. It’s not often acknowledged, but our beleaguered managers in today’s environment need to be highly skilled in a million different things. First aiders, fire wardens, playground supervisors, head teachers, occupational therapists, sleuths, psychologists, record keepers, legal experts to name just a few! Every single day, staff present their managers with new challenges and new demands, always expecting the line managers to step up and be accountable. And these expectations of managers’ skills continue with a vengeance when an organisation is undergoing change. High emotions – leading to challenging situations such as dealing with anger, tears, withdrawal from the group, increased chat, reduced productivity, staff turnover and rampant negativity. Increasing absence levels (or lateness) – needing to be managed firmly but fairly within the company processes and procedures to ensure standards do not slip and small issues don’t suddenly explode into big issues (e.g. when short term absence suddenly becomes a long term absence issue). Shortened fuses and increased stress amongst staff – resulting in errors, bad temper, staff who play the blame game, increased turnover, absence and conflict between colleagues. Defensive confrontation – This is when employees feel their back is to the wall so they come out fighting and demanding (pay offs, quicker decisions, guarantees, less change, more communication etc). Always difficult to manage when the threats and complaints are coming at you thick and fast. Head in the sand – finally, a common challenge for managers is ‘head in sand’ i.e. when the directors of the business do not see any reason to spend money or leadership time to facilitate change, support new teams integration, build up new teams, engage with disgruntled staff etc. If they are the challenges, what is our advice? Educate and develop skills – osmosis (if you remember your biology at school) does not apply! Managers don’t just absorb what they need to know through the skin. So take time to educate them about managing change, develop their skills, build their knowledge and provide them with the support of those with more experience. Named contact – provide a named person to support your line managers who are managing other people’s emotions. You can’t just expect them to be able to absorb emotion without getting stressed themselves. They need an outlet and often a sounding board too. Plan – remind the organisation’s directors that if you fail to plan, you plan to fail. Change needs to be managed and to do that successfully you need to have a plan and to revisit that plan on a regular basis. Planning isn’t an optional extra during times of change. And if you’re not convinced about this, check out the stats on how many MBOs (management buy outs) and mergers really succeed. Educate employees – about how they might themselves react to change (there is a module on this in our Bag of Learning, see below). Help them to understand their likely emotions and likely reactions so they don’t feel so out of control and out of kilter when the world is changing around them. They might also then be in a better position to support colleagues who are struggling with change. Use psychometric profiling – to understand who within the organisation is more likely to be pushing for change and who is more likely to be resisting change, then organise roles, support and communications accordingly. Use profiling too to create a framework for supporting with rebuilding morale and creating new teams. 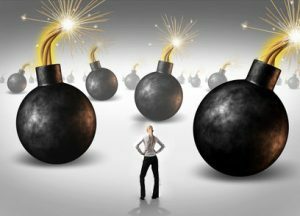 Change saboteurs – identify and move out of harms way your change saboteurs, these people will nit pick and undermine you at every opportunity. It’s the worst feeling in the world to look back at a change project three long hard months in and be able to see that it was always doomed to fail due to certain individuals who were never going to let it succeed. Often not deliberately, but very often as a result of their insecurities. So identify them and remove them from the scene before you begin. Rethink your timescales – so often we hear that a business is planning a significant change in April but then expects everything to be business as usual from May. Think again. Change, real change that is, often takes months, if not years so rethink your plan accordingly. Pick up your Bag today and make the whole change process a lot smoother!